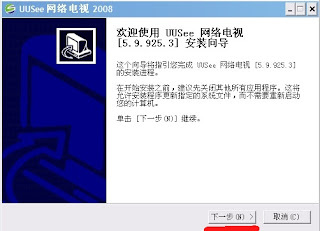 A reader sent an email and asked me about how to use another Chinese p2p internet TV client - UUSEE, like other same Chinese p2p internet TV clients, UUSEE can help you to watch many TV programs on computer by internet included some live sport games. But it has a big problem for people who do not understand Chinese, because it is only Chinese version. 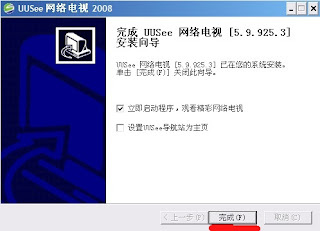 Today, I would like simple tell you how to install UUSEE and watch some sport channels. First, you have to download UUSEE. Direct download file from official site. For oversea download. I strong suggest download this one if you are not live in China. Second part is install UUSEE. 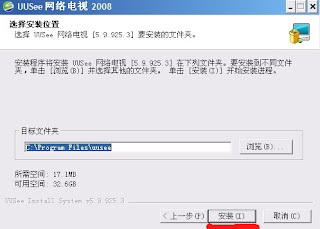 I must say it is a junk software, so you have to be careful while you install it. Take look these screenshots below. 1, Click "Next" button (N), I marked red color. 2, Click "I agreed" button (I). 3, Be careful here, it asks you install a bunch software. If you do not need you do not have to tick any one. Then, Click "Next" button (N). If you choose oversea version it does not have these junk software. 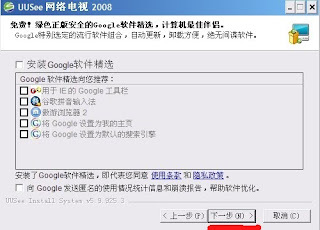 6, Do not tick second line, that will change your browser main page. Click "Finish" button (F), all done. After that, you can start client, take look this screenshot below. Click "Sport Channel(体育直播)", spread some channels. Choose a channel that you want watch, double clicks it will play show after buffer. It has many sport channels included some live sport games. I personal do not like this software, because too much ads and junk information. 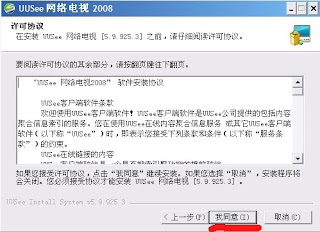 I am not recommend this one to users who do not understand Chinese, because too difficult to figure out how to use it.